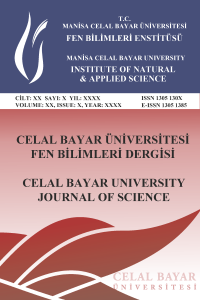 Celal Bayar University Journal of Science (CBUJOS) welcomes authors from all over the world to share their innovative research and findings. You can submit your research on any scientific topic in your area of expertise. CBUJOS only publishes high quality Research. Research should be unique, original and the presentation must be of potential interest to the readers. You can submit your research articles. These research must be original and must be in the major field of science. The research articles can include the findings and the methodology you used. When you submit articles to CBUJOS, you are implying that the manuscript submitted is unique and original. We are strictly following the publication ethics & malpractices statement of CBUJOS (http://dergipark.gov.tr/cbayarfbe/page/1917). Please submit your article prepared according to article template and Information for Authors.